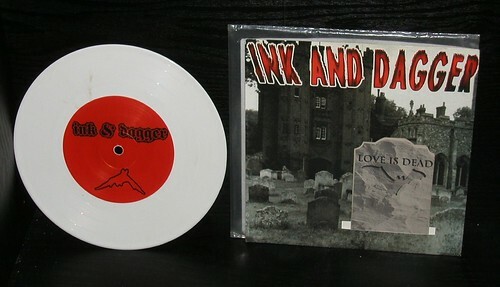 Here's the Ink and Dagger - Love is Dead 7". You don't see this around as much as you did about 6 or 7 years ago. It use to be all over ebay, and I wish I would have predicted how rare it would become. Some of the interesting things about this record is, one, that it's their first release, and two that it came with this tombstone insert that gets stuck in the cover. You can see it in the picture. It's one of the weirdest designs I've ever seen, but definitely innovative. I actually got to see these guys on long island a long time ago. They were all duded up in make up and stuff. One of the first bands that I ever saw do this sort of theatrical type performance. I saw Gwar once in the mid 90s and of course they took it to an all time high. IAD wasn't anything like that though. Gwar's show is more impressive then their music. But IAD music was better than their show. Their show just added to the weird allure of it. It was kinda like when I saw Dillenger Escape Plan back in the 90s and they had 2 guys dressed up like clowns running through the crowd with strob lights going. So how did I get hold of this record. Well back when I first started collecting I made a very big purchase off someone on Long Island and this was part of it. I think I bought like 100 7"s from him and I paid about 90 bucks. The list of 7"s in that lot was pretty impressive. And I think it would be a cool little trip down memory lane if I revisted a few of the rarer ones. So next time, let's do a Long Island band. P.s. Some of you might have noticed that I didn't explain, you're one of us, you're one of us! Well it's not from Ink and Dagger obviously. No one got it, so I thought I would give the next line in the song and if someone gets it, then I will send them a 7" and then do the post on the record that the hint is from. Let's recap this game so everyone understands. I'm going to be doing posts on the records from the 100 count lot I bought back in the late 90s, and while I do that, I will keep giving hints on this other record. If someone figures it out, I will do a quick little post on it, and send the winner a 7". Ok here it is, "You're one of us! You're one of us! We accept you!" Greg - Not really sure. I don't think it's more than say 30. But prices on this band are a little skewed due to the reunions...or semi reunions.